A Plus Warehouse carries the best quality jib booms around. Our booms are perfect for carrying heavy objects such as drums in a safe way. Our booms are safe and easy to use. They make the process of transporting material quite efficient. This is the way to go for transporting your drums and other objects. The Hydraulic Drum Carrier Boom is a great carrier of ours. It is a quick ship which is always very convenient. 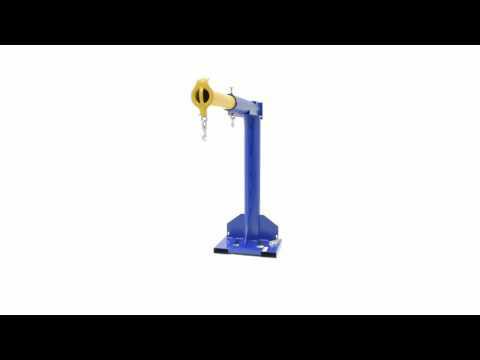 This piece of equipment allows one person to easily lift, transport, and dispense fully loaded drums. A job for several will become a job for one with this tool. The drum is safely secured to the saddle and lifted by pumping the hydraulic foot pump. You can buy this powered or with a hand crank. The hand crank is good because it is cheaper, and the powered boom is better because it can be handled faster. This item has a full range of rotation to accomplish tasks simply. This product can hold a massive 800 pounds! Perfect for many drums! Our Empire State High Riser Booms is just what you need if you are searching for a product that is a Large and Sturdy Boom. You have the option of 4,000 pound capacity, and even 6,000 pounds. Our capacity is measured from our 30 inch hook position, so if you move it your capacity will vary. Your fork spaces can range from 24 inches, 30 inches, or 36 inches. This tool can have a handful of uses. You can always count on this tool when you need to transport heavy objects. A Plus Warehouse shows the best quality products on our website. We only sell you the best because we care. We are well known for our lockers, work benches, dollies, shelving, conveyors and many more. With each product we like to give several options for you to choose from. Our options range from sizes, colors, and even lock options.